Neurocutaneous syndromes or phakomatoses from the Greek phacos = lens, spot; phaos = light, literally meaning "tumor of lenses" after the retinal hamartomas that would eventually be recognized as part of constellation of findings now recognized as tuberous sclerosis complex. Neurocutaneous syndromes represent a group of central nervous system disorders with concurrent lesions in the skin, eye, and possibly other visceral organs. The neurocutaneous manifestations are related to the common ectodermal origin of these organs. They include tuberous sclerosis complex, Sturge-Weber syndrome, von Hippel-Lindau disease, and neurofibromatosis. The definition can be expanded to include other entities such as ataxia telangiectasia, incontinentia pigmenti, nevoid basal cell carcinoma syndrome (Gorlin syndrome), among others. In practice, sporadic glioneuronal hamartoma is a diagnosis rarely made in cortical resections for epilepsy—at least at the authors' center. A much more common diagnosis (the most common diagnosis in infants with intractable seizures, including infantile spasm seizures [ISS]) is that of "cortical dysplasia," a malformation of cortical development (MCD) which, in its extreme form, shows features almost identical to those of a tuber of tuberous sclerosis complex. Glioneuronal hamartomas are occasionally found at autopsy in noncortical regions, where they are not associated with the "epileptic " phenotype and are often discovered in entirely asymptomatic individuals. Von Hippel-Lindau (VHL) disease is an inherited syndrome which manifests with neoplasia in a variety of organs with marked variability of expression of disease. It is inherited in an autosomal dominant fashion and has variable penetrance. This constellation of findings that occur in VHL was first described in a brother and sister in 1894. VHL is named after Eugen von Hippel, a German ophthalmologist, who described patients to have what we now know to be VHL disease; and Arvind Lindau, a Swedish neuropathologist who pieced together the systemic character and hereditary nature of the disease. [7, 8] von Hippel-Lindau disease was first used as a name to designate this disorder in 1936. The disease is characterized by multiple tumors in multiple different organs. Most commonly these are hemangioblastomas, clear cell renal cell carcinoma, pheochromocytomas, endolymphatic sac tumors, neuroendocrine neoplasms of the pancreas as well pancreatic and renal cysts. The most characteristic tuberous sclerosis complex lesions of the brain include cortical tubers, subependymal nodules (SENs), and subependymal giant cell tumors (SGCTs) (or, subependymal giant cell astrocytomas [SEGAs]). The term "tumor" rather than "astrocytoma" is preferred by some authors due to the entity’s propensity to look neuronal as well as astrocytic versus astrocytic alone. The descriptor SEGA is still in widespread use and the issue of terminology has not been definitively resolved. MRI scan of a patient with tuberous sclerosis complex (TSC), pretuberectomy and post-tuberectomy. Panel A shows several tubers, indicated by arrows. Panel B shows PET scan at approximately the same axial plane. Arrow indicates a region of hypometabolism in the right parieto-occipital cortex. Panel C shows post-tuberectomy MRI. (Images courtesy of Dr. Noriko Salamon, UCLA). 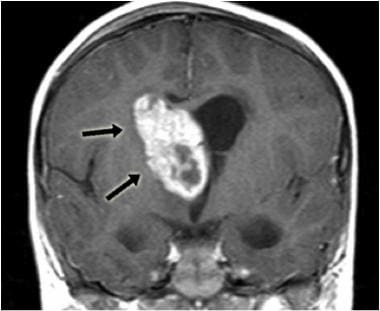 MRI image of subependymal giant cell astrocytoma/subependymal giant-cell tumor (SEGA/SGCT; arrows) occupying the right lateral ventricle. Note nonhomogeneous contrast enhancement. (Image courtesy of Dr. Noriko Salamon, UCLA). Neuroimaging of Sturge-Weber syndrome (SWS) shows a characteristic tram-track appearance on the side of the malformation. 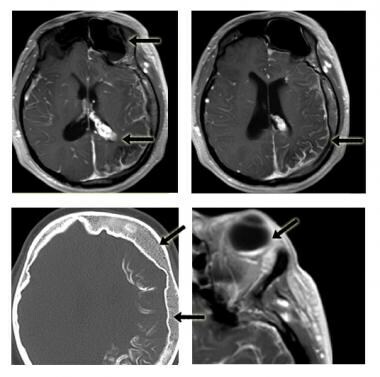 Gliosis and microcalcifications may be seen within the cortex; soft-tissue radiographs of a fixed brain slice from an afflicted individual can yield, as a result, a dramatic tram-track appearance that recapitulates the same features noted on a lateral skull radiograph (a procedure rarely carried out in this day of highly sophisticated MRI and positron emission tomography [PET] scanning; see the images below). Postcontrast axial T1 images. These show leptomeningeal enhancement (arrows) and enlarged left-sided choroid plexus. The venous superficial drainage is obstructed and therefore drains into the deep system, including choroid plexus, resulting in ipsilateral choroid plexus enlargement. (Images courtesy of Dr. Noriko Salamon, UCLA). A case of bilateral Sturge-Weber syndrome (SWS; more severe atrophy of the left cerebral hemisphere than the right). Top 4 patients and 2 right-hand panels on the bottom represent axial cuts, while 2 left-hand panels on the bottom represent coronal cuts. FLAIR images on the top, T2-weighted images on the bottom. (Images courtesy of Dr. Noriko Salamon, UCLA). Hemangioblastomas are slow growing tumors that often show symptoms through mass effect, symptoms are often related to intracranial pressure, back pain, and weakness. NF2 does not have outward signs of disease. Often the first sign of disease is hearing difficulties. Grossly, the tubers of tuberous sclerosis complex are well-circumscribed (although not encapsulated), firm lesions, usually confined to the cortex and underlying white matter of one gyrus but sometimes crossing gyral boundaries (see the following image). Specimens obtained from tuber resection from a patient with tuberous sclerosis complex (TSC). A) External view of the specimen. B) Multiple tubers (in cut specimen) showing variable effacement of the cortex-white matter junction (eg, arrows). 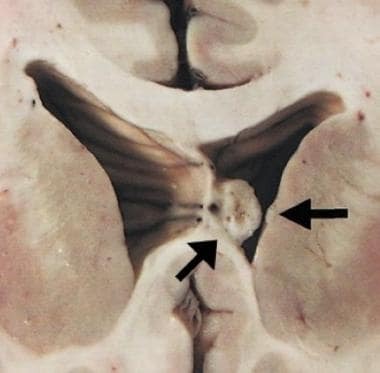 C) Slice from another region of the specimen shows a "tuber" (lower arrows) and a large mushroom-shaped gyrus with complete effacement of the cortex-white matter junction. Subependymal nodules (SENs; see the image below) and subependymal giant cell astrocytomas/tumors (SEGAs/SGCTs) are histologically similar lesions that are differentiated by size, with SENs being less than 1 cm and SEGAs/SGCTs being greater than 1 cm in maximal dimension. SENs are present in about 80% of patients with tuberous sclerosis complex and may develop during fetal life. 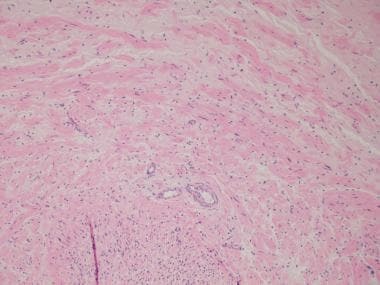 The small size of SENs and their lack of clinical manifestations yield very few surgical resections of such lesions; as a result, they are rarely seen by the pathologist. Subependymal nodule (arrows) that appears to originate from the septum pellucidum. Based upon serial neuroimaging studies, SENs are thought to give rise to SEGAs/SGCTs. SEGAs/SGCTs are comparatively rare and are present in 6-14% of patients with confirmed tuberous sclerosis complex. Their most common location is the lateral ventricle at the foramen of Monro. This location can lead to cerebrospinal fluid (CSF) obstruction and hydrocephalus, which in turn is the most common cause for their removal. In Sturge-Weber syndrome, gross sections of the affected cortical region have dark, thickened, granular leptomeninges due to the increased vasculature. The underlying cortex is atrophic. The cutaneous findings in SWS are those of a port-wine stain. A port-wine stain is almost always present at birth, they are sharply demarcated red-to-violaceous macules or patches that are often lateralized and non-blanching, and non-regressing. 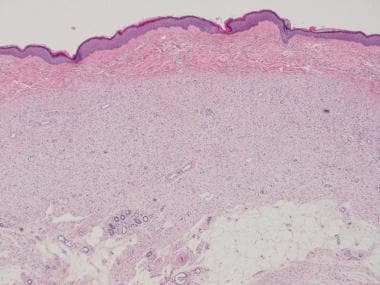 These lesions should not be confused with salmon patches (colloquially "stork bite" or "angel kiss"), a common cutaneous finding after birth. These lesions are often lighter in color, symmetric, completely blanchable and resolve spontaneously. Neurofibromas are solitary erythematous nodules. Subcutaneous neurofibromas may be uncomfortable or even painful. Plexiform neurofibromas classically have a "bag of worms" appearance. H&E-stained section of a tuber. Noted pronounced cortical disorganization, with a ‘chaotic' admixture of cells with neuronal, astrocytic and indeterminate phenotype. Arrow indicates a cell with a nucleolated nucleus but pale eosinophilic cytoplasm; arrowhead indicates a balloon cell. Many of the cells appear to have cytoplasmic aggregates of basophilic material. Cytologic features of a tuber. Panels A and B show typical balloon cells at low (A) and high (B) magnification. Note glassy eosinophilic cytoplasm and characteristic coarse chromatin pattern (arrow in B). 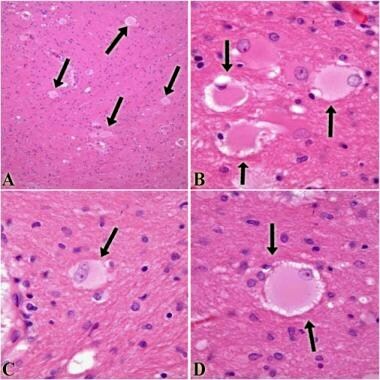 Panels C and D show dysmorphic, somewhat enlarged (eg, arrow in D) neurons in a disorganized pattern—at low magnification in C, higher magnification in D.
Balloon cells are large, usually round and oval, with eosinophilic cytoplasm, a nucleus with coarse chromatin, and prominent nucleoli. Balloon cells may be multinucleated or have multilobulated nuclei, the lobes being connected by thin "bridges." Balloon cells characteristic of a TSC tuber. Their presence can often be suspected at low magnification (panel A, arrows). Panel C (arrow) indicates a binucleate balloon cell. Arrows in other panels highlight balloon cells. The dysmorphic, cytomegalic neurons within tubers may show cytoskeletal disorganization and "coarsening" on routine stains; silver stains (eg, the modified Bielschowsky technique) confirm the presence of cytoskeletal abnormalities—sometimes resembling the neurofibrillary tangles seen in Alzheimer disease (see the images below). 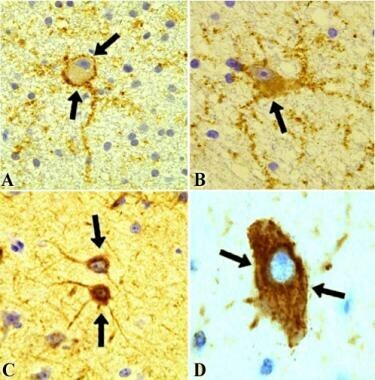 Dysmorphic neurons (arrows), with cytoplasm showing coarse Nissl substance (A,B) or pale amphophilic cytoplasm (C). Silver (Bielschowsky)-stained section of a cortical tuber, showing cytoskeletal fibrillar aggregates (eg, arrow) similar to those seen in the neurofibrillary tangles of AD. Arrowheads indicate pale-staining balloon cells. Both subependymal nodules (SENs) and subependymal giant cell tumors (SGCTs) (or, subependymal giant cell astrocytomas [SEGAs]) are made up of dysmorphic glial cells similar to those seen within tubers, and plump cells with eosinophilic cytoplasm within a fibrillar vascular stroma (see the following image). SEGAs have an additional cell type (compared with SENs) that is more elongated and spindled that sometimes forms perivascular pseudorosettes. [16, 21, 22] SEGAs can be quite pleomorphic and mitoses vary, although they may be present in 50% of cases, and they are usually few. Necrosis and vascular endothelial proliferation may be present, but this does not affect prognosis. Neither lesion is infiltrative. H&E-stained section of a subependymal giant-cell tumor/subependymal giant cell astrocytoma (SEGA/SGCT). The arrows highlight the plump cells with eosinophilic cytoplasm that are commonly seen. Hemangioblastoma: Seventy-percent of VHL patients develop hemangioblastomas, most commonly of the CNS and retina. While not exclusive to VHL, 25% of hemangioblastomas do occur in the setting of VHL. Histologically these lesions are composed of a variably sized dense capillary network with hyperplastic endothelial cells interspersed with interstitial stromal cells with variable amounts of vacuolated cytoplasm. Neurofibroma: Well circumscribed nodule of loosely arranged, non-encapsulated, short spindle cells in the dermis or subcutis. Spindle cells appear a short cells with wavy nuclei in a loose fibrillar matrix, entrapped collagen fibers occasionally give the histologic appearance of "shredded carrots." 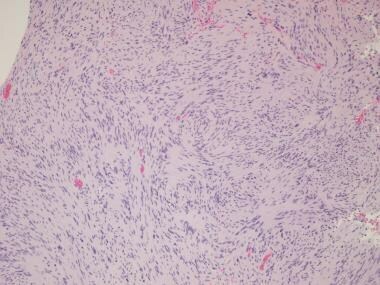 Plexiform Neurofibroma: These lesions are a pathognomonic lesions of NF1. 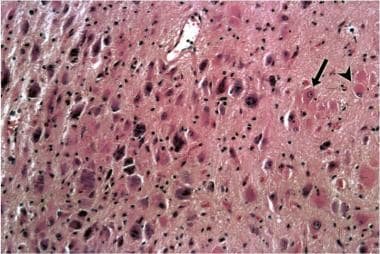 Histologically these lesions are composed of a mass of nerve fibers in a complex arrangement surrounded by extensive myxoid changes and the typically appearance of neurofibroma. Bilateral vestibular schwannomas are the classic lesion of NF2. These are histologically composed of encapsulated spindle cell tumors which are often biphasic, being composed of cellular (Antoni A) areas, and less cellular, myxoid (Antoni B) areas. Nuclei often arrange themselves in a palisaded arrangement forming organized arrangements known as Verocay bodies. The use of immunohistochemical (IHC) stains helps to highlight some unique findings within a tuber compared with surrounding parenchyma. Glial fibrillary acidic protein (GFAP) immunohistochemistry highlights astrocytes and shows variable immunoreactivity within the previously described balloon cells (see the following image). CD68 immunostain will highlight increased numbers of microglial cells, which may be a nonspecific response to activity within "epileptogenic tissue." Neurofilament immunoreactivity is variable and highlights dysmorphic neurons, whereas synaptophysin usually stains neuronal membranes. Immunostains in cortical tubers. 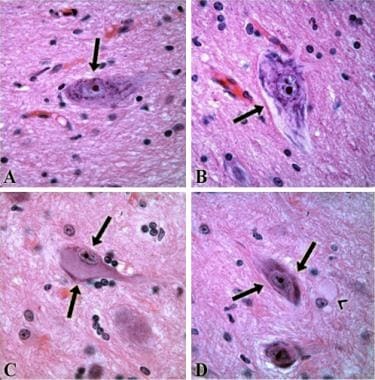 Synaptophysin immunohistochemistry (panels A, B) shows either neuronal membrane (A) or cytoplasmic (B) staining. Antibodies to neurofilament (C, D) show cytoplasmic staining that often extends into neuronal processes (C). Silver stains highlight neuronal cytoskeletal abnormalities similar to those seen within neurofibrillary tangles of Alzheimer disease, although ultrastructurally, the neurons do not show the typical paired helical filaments characteristic of Alzheimer disease neurons. Myelin stains (eg, Kluver-Barrera) show attenuation where the tubers extend into the subcortical white matter and can highlight the junction between a tuber and more normal brain. Immunohistochemical staining of a subependymal giant cell astrocytoma/subependymal giant-cell tumor (SEGA/SEGT). Panels A and B show cells with positive staining for NF and synaptophysin, proving neuronal differentiation. Panels C and D show plump glial cells positive for GFAP. Tuberous sclerosis complex (TSC) has fascinated both neuroscientists (because of its myriad of clinical neurologic manifestations) and oncologists (because many of its clinicopathologic features result from abnormal growth of various cell types, both in the brain and extra-central nervous system [CNS] tissues). The genetics of tuberous sclerosis complex were substantially advanced by the discovery, in 1993 and 1997, of 2 genes, mutations in which cause the disorder. First to be discovered was the TSC2 gene (on chromosome 16p13, containing 41 exons) which encodes a protein tuberin, whereas the TSC1 gene (on chromosome 9q34, 23 exons) encodes hamartin. Both deletions and point mutations in either gene can occur to cause the disorder, and these events can take place at almost any point in each gene. Soon after the sequences of the TSC2/TSC1 genes were published, probes were developed and labeled in order to examine gene expression within tissues and tuberous sclerosis complex–associated lesions. Immuno reagents including antibodies to tuberin and hamartin were developed and could be used in immunohistochemical and immunoblotting protocols to evaluate where the proteins were expressed. Both in situ hybridization and immunocytochemical studies showed that TSC2 was widely expressed throughout the body (eg, in lymphocytes, epithelia, and endocrine tissues). 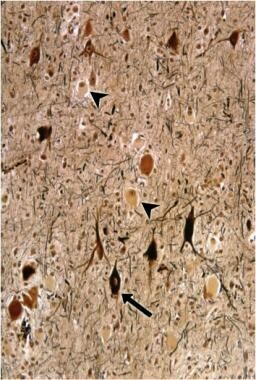 Within the brain, tuberin was prominent in pyramidal neurons. It was hoped that a given brain tuberous sclerosis complex lesion would show either a unique pattern of expression of either tuberin or hamartin or a characteristic lack of expression of either protein, so that a simple immunohistochemical test (on a brain biopsy) could confirm, support, or refute the diagnosis of subependymal nodules (SENs), subependymal giant-cell tumors (SGCTs) (or, subependymal giant cell astrocytoma [SEGA]), or tuber. Surgical resection has become the mainstay of treatment for intractable seizures due to cortical tubers, especially in patients who have few lesions or only a single identifiable seizure focus. Controversy exists as to the optimal treatment in those patients who suffer from multiple seizure foci, although in many cases resection of one of more of the foci can still offer significant, although sometimes partial, relief from symptoms. Bollo et al have seen success with a multistage technique in which 3 surgeries are performed during the same hospitalization. Good presurgical selection has greatly improved outcomes for patients in whom surgery is performed. The prognosis for patients with VHL largely depends on the location and type of tumors that they have. Hemangioblastomas may not need clinical intervention depending on the site and tumor size. Some tumors may not progress while others may develop enlarging cysts or begin to cause clinical symptomology. Neurofibromas and plexiform neurofibromas have the potential to undergo malignant transformation into malignant peripheral nerve sheath tumor (MPNST). Approximately 50% of MPNSTs occur in the background of neurofibromatosis. The diagnosis of MPNST carries a poor prognosis and contributes to the decreased lifespan of NF patients. Chan JW. Neuro-ophthalmic features of the neurocutaneous syndromes. Int Ophthalmol Clin. 2012 Summer. 52(3):73-85, xi. [Medline]. Crino PB, Nathanson KL, Henske EP. The tuberous sclerosis complex. N Engl J Med. 2006 Sep 28. 355(13):1345-56. [Medline]. Tuberous Sclerosis Alliance. Diagnostic criteria: revised diagnostic criteria for tuberous sclerosis complex. Tuberous Sclerosis Alliance. Available at http://www.tsalliance.org/pages.aspx?content=54. Accessed: December 1, 2015. Comi AM. Sturge-Weber syndrome. Handb Clin Neurol. 2015. 132:157-68. [Medline]. Nowak CB. The phakomatoses: dermatologic clues to neurologic anomalies. Semin Pediatr Neurol. 2007 Sep. 14(3):140-9. [Medline]. Sudarsanam A, Ardern-Holmes SL. Sturge-Weber syndrome: from the past to the present. Eur J Paediatr Neurol. May 2014. 18:257-66. [Medline]. Kaelin WG. 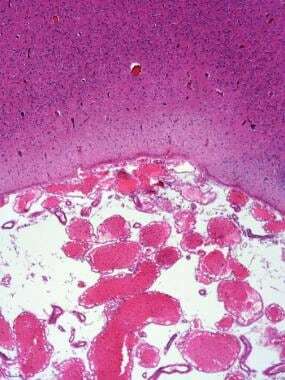 Von Hippel-Lindau disease. Annu Rev Pathol. 2007. 2:145-73. [Medline]. Maher ER, Neumann HP, Richard S. von Hippel-Lindau disease: a clinical and scientific review. Eur J Hum Genet. 2011 Jun. 19:617-23. [Medline]. Friedman JM. Neurofibromatosis 1. Pagon RA, Adam MP, Ardinger HH, et al, eds. GeneReviews. Seattle: University of Washington, Seattle; 2014 Sep 04. [Full Text]. Ragge NK, Falk RE, Cohen WE, Murphree AL. Images of Lisch nodules across the spectrum. Eye. 1993. 7:95-101. [Medline]. Ferner RE. The neurofibromatoses. Pract Neurol. 2010 Apr. 10:82-92. [Medline]. Cakirer S, Yagmurlu B, Savas MR. Sturge-Weber syndrome: diffusion magnetic resonance imaging and proton magnetic resonance spectroscopy findings. Acta Radiol. 2005 Jul. 46(4):407-10. [Medline]. Park SH, Pepkowitz SH, Kerfoot C, et al. 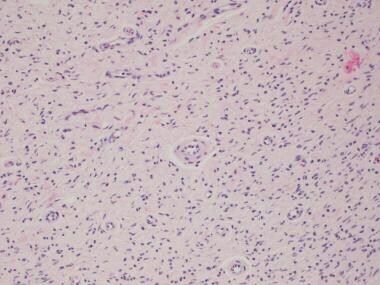 Tuberous sclerosis in a 20-week gestation fetus: immunohistochemical study. Acta Neuropathol. 1997 Aug. 94(2):180-6. [Medline]. 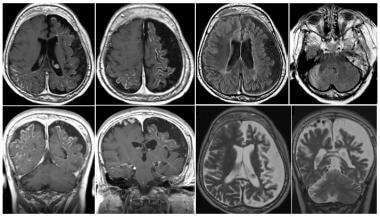 Goodman M, Lamm SH, Engel A, Shepherd CW, Houser OW, Gomez MR. Cortical tuber count: a biomarker indicating neurologic severity of tuberous sclerosis complex. J Child Neurol. 1997 Feb. 12(2):85-90. [Medline]. Lopes MBS, Wiestler OD, Stemmer-Rachamimov AO, Sharma MC. Tuberous sclerosis complex and subependymal giant cell astrocytoma. Louis DN, Ohgaki H, Wiestler OD, Cavenee EK, eds. WHO Classification of Tumours of the Central Nervous System. Lyon, France: International Agency for Research on Cancer (IARC); 2007. 218-21. Nishio S, Morioka T, Suzuki S, Kira R, Mihara F, Fukui M. Subependymal giant cell astrocytoma: clinical and neuroimaging features of four cases. J Clin Neurosci. 2001 Jan. 8(1):31-4. [Medline]. Thomas-Sohl KA, Vaslow DF, Maria BL. Sturge-Weber syndrome: a review. Pediatr Neurol. 2004 May. 30(5):303-10. [Medline]. Ferner RE, Huson SM, Thomas N, et al. Guidelines for the diagnosis and management of individuals with neurofibromatosis 1. J Med Genet. 2007 Feb. 44(2):81-8. [Medline]. Neurofibromatosis. Conference statement. National Institutes of Health Consensus Development Conference. Arch Neurol. 1988 May. 45(5):575-8. [Medline]. Vinters HV, Miyata H. Tuberous sclerosis. Golden JA, Harding BH, eds. Pathology & Genetics. Developmental Neuropathology. Basel: ISN Neuropath Press; 2004. 79-88. Louis DN, Frosch MP, Mena H, Rushing EJ, Judkins AR. Seizure disorders and malformations. King DW, Gardner LH, Stocker JT, Wagner B, eds. Non-neoplastic Diseases of the Central Nervous System. Washington, DC: American Registry of Pathology; 2009. 377-88. 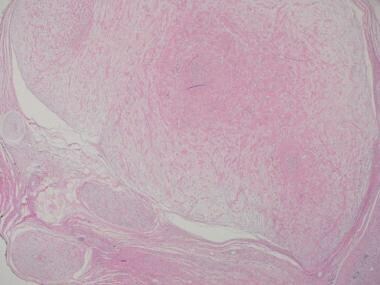 Vinters HV, Miyata H. Neuropathologic features of tuberous sclerosis. McLendon RE, Rosenblum MK, Bigner DD, eds. Russell and Rubinstein's Pathology of Tumors of the Nervous System. New York: Hodder Arnold; 2006. 955-69. Comi AM. Pathophysiology of Sturge-Weber syndrome. J Child Neurol. 2003 Aug. 18(8):509-16. [Medline]. Burger PC, Scheithauer BW. Tumors of the neuroglia and choroid plexus. Silverberg SG, Sobin LH, eds. Tumors of the Central Nervous System. Washington, DC: American Registry of Pathology; 2007. 114-18. Bodensteiner JB, Roach ES. Sturge-Weber Syndrome. Mount Freedom, NJ: Sturge-Weber Foundation; 1999. 95. Crino PB, Miyata H, Vinters HV. Neurodevelopmental disorders as a cause of seizures: neuropathologic, genetic, and mechanistic considerations. Brain Pathol. 2002 Apr. 12(2):212-33. [Medline]. Boer K, Crino PB, Gorter JA, et al. Gene expression analysis of tuberous sclerosis complex cortical tubers reveals increased expression of adhesion and inflammatory factors. Brain Pathol. 2010 Jul. 20(4):704-19. [Medline]. [Full Text]. Lee A, Maldonado M, Baybis M, et al. Markers of cellular proliferation are expressed in cortical tubers. Ann Neurol. 2003 May. 53(5):668-73. [Medline]. Crino PB, Mehta RI, Vinters HV. Pathogenesis of TSC in the brain. Kwiatkowski DJ, Whittemore VH, Thiele E, eds. Tuberous Sclerosis Complex: Genes, Clinical Features and Therapeutics. Berlin: Wiley-VCH; 2010. 159-83. Gyure KA, Prayson RA. 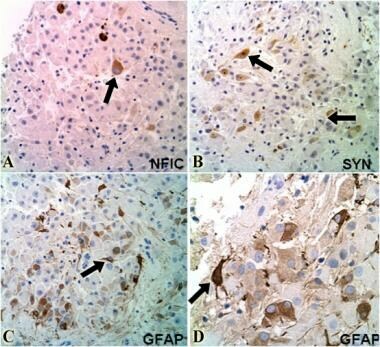 Subependymal giant cell astrocytoma: a clinicopathologic study with HMB45 and MIB-1 immunohistochemical analysis. Mod Pathol. 1997 Apr. 10(4):313-7. [Medline]. Menchine M, Emelin JK, Mischel PS, et al. Tissue and cell-type specific expression of the tuberous sclerosis gene, TSC2, in human tissues. Mod Pathol. 1996 Nov. 9(11):1071-80. [Medline]. Kerfoot C, Wienecke R, Menchine M, et al. 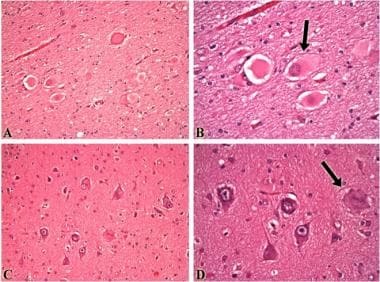 Localization of tuberous sclerosis 2 mRNA and its protein product tuberin in normal human brain and in cerebral lesions of patients with tuberous sclerosis. Brain Pathol. 1996 Oct. 6(4):367-75. [Medline]. Johnson MW, Emelin JK, Park SH, Vinters HV. Co-localization of TSC1 and TSC2 gene products in tubers of patients with tuberous sclerosis. Brain Pathol. 1999 Jan. 9(1):45-54. [Medline]. Mizuguchi M, Takashima S, Yamanouchi H, Nakazato Y, Mitani H, Hino O. 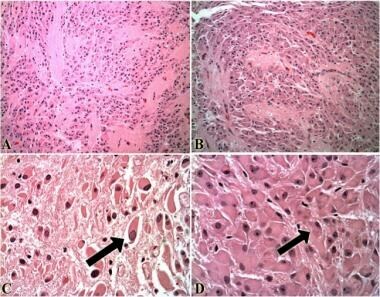 Novel cerebral lesions in the Eker rat model of tuberous sclerosis: cortical tuber and anaplastic ganglioglioma. J Neuropathol Exp Neurol. 2000 Mar. 59(3):188-96. [Medline]. Meikle L, Talos DM, Onda H, et al. A mouse model of tuberous sclerosis: neuronal loss of Tsc1 causes dysplastic and ectopic neurons, reduced myelination, seizure activity, and limited survival. J Neurosci. 2007 May 23. 27(21):5546-58. [Medline]. Meikle L, Pollizzi K, Egnor A, et al. Response of a neuronal model of tuberous sclerosis to mammalian target of rapamycin (mTOR) inhibitors: effects on mTORC1 and Akt signaling lead to improved survival and function. J Neurosci. 2008 May 21. 28(21):5422-32. [Medline]. [Full Text]. Miyata H, Chiang AC, Vinters HV. Insulin signaling pathways in cortical dysplasia and TSC-tubers: tissue microarray analysis. Ann Neurol. 2004 Oct. 56(4):510-9. [Medline]. Qin W, Chan JA, Vinters HV, et al. Analysis of TSC cortical tubers by deep sequencing of TSC1, TSC2 and KRAS demonstrates that small second-hit mutations in these genes are rare events. Brain Pathol. 2010 Nov. 20(6):1096-105. [Medline]. [Full Text]. Genes: GNAQ. Genetics Home Reference. Available at http://ghr.nlm.nih.gov/gene/GNAQ. November 23, 2015; Accessed: December 1, 2015. Gossage L, Eisen T, Maher ER. VHL, the story of a tumour suppressor gene. Nat Rev Cancer. 2015 Jan. 15(1):55-64. [Medline]. Genes: VHL. Genetics Home Reference. Available at http://ghr.nlm.nih.gov/gene/VHL. December 7, 2015; Accessed: December 10, 2015. Neurofibromatosis type 1. Genetics Home Reference. Available at http://ghr.nlm.nih.gov/condition/neurofibromatosis-type-1. July 2012; Accessed: December 14, 2015. Genes: NF2. Genetics Home Reference. Available at http://ghr.nlm.nih.gov/gene/NF2. March 2007; Accessed: December 14, 2015. Bollo RJ, Kalhorn SP, Carlson C, Haegeli V, Devinsky O, Weiner HL. Epilepsy surgery and tuberous sclerosis complex: special considerations. Neurosurg Focus. 2008 Sep. 25(3):E13. [Medline]. Teutonico F, Mai R, Devinsky O, et al. Epilepsy surgery in tuberous sclerosis complex: early predictive elements and outcome. Childs Nerv Syst. 2008 Dec. 24(12):1437-45. [Medline]. Koenig MK, Butler IJ, Northrup H. Regression of subependymal giant cell astrocytoma with rapamycin in tuberous sclerosis complex. J Child Neurol. 2008 Oct. 23(10):1238-9. [Medline]. Acknowledgments The authors would like to thank Noriko Salamon, MD, for the use of her radiographic images. The authors would also like to thank Santino Lamancusa for his work with the digital images.